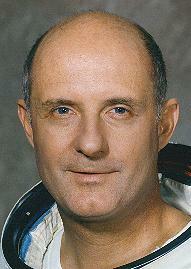 Thomas Stafford is a veteran American astronaut and career Air Force officer, selected by NASA in 1962. Stafford served as backup pilot for Gemini 3 and pilot for Gemini 6, became command pilot for Gemini 9 upon the death of a prime crew member, and was backup commander for Apollo 7, commander of Apollo 10, and commander of the Apollo-Soyuz Test Project. He resigned from NASA on November 1, 1975, to become commander of the Air Force Flight Test Center, Edwards Air Force Base. He was promoted to Air Force Deputy Chief of Staff for Research and Development in March 1978 and retired from the Air Force in November 1979. Subsequently he held a number of senior management positions.